A lot of you devoted v:gourmet fans are from Toronto so I thought I would post some restaurant reviews to get you out of your kitchen and into the world v:eating out in Toronto. I have some general tips on v:eating out in my musings section which you should review but here are some specifics on places we like, and places we don’t. If we go out, we go out to eat so it better be good because life’s too short. By far the best vegan eating experience I’ve had in the city. Hands down. Incredible food. No questions asked. Fantastic presentation. Great variety and the taste is superb. So good in fact, don’t bother ordering from the menu. Just ask the chef to prepare something. It’s sure to be good. It’s a nice night out (i.e. a little pricier than other establishments we frequent) but it’s become our go-to place for really good vegan fare. It’s number one on my list and I tell them so each time I go. They are to be congratulated! Want to be totally convinced? Well, we went last night and started the meal with a shaved fennel salad with grapefruit and a cranberry coulis. We then moved onto skewered artichoke hearts with barley broccoli risotto on pear carpaccio with a carrot purée on the side. 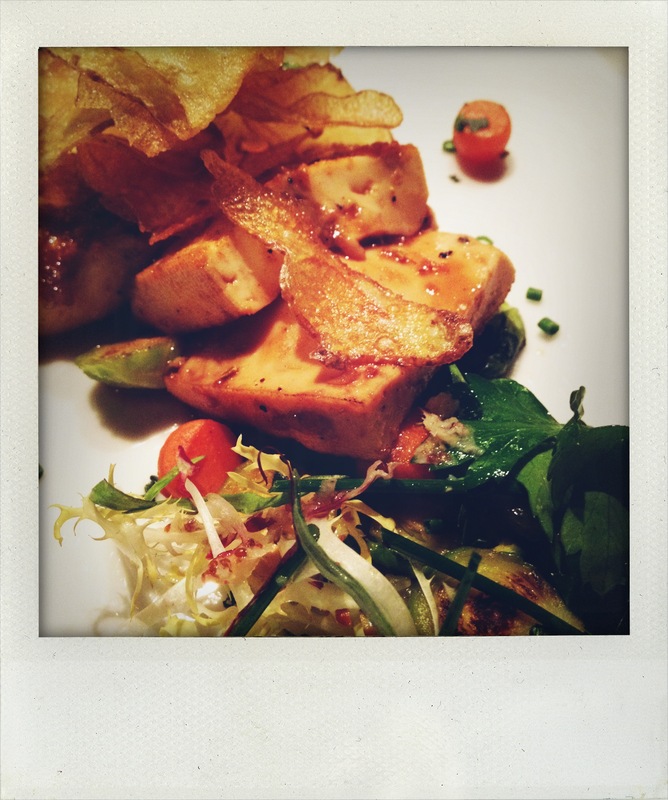 And for the main course – spiced tofu with a chili purée accompanied by curried brussels sprouts, pearl carrot stir-fry, fingerling potato chips, and a side of enoki mushroom and sprout salad. Instead of the regular cheese offering, they then brought us a pomegranate and persimmon composé with sliced apples and pineapple. 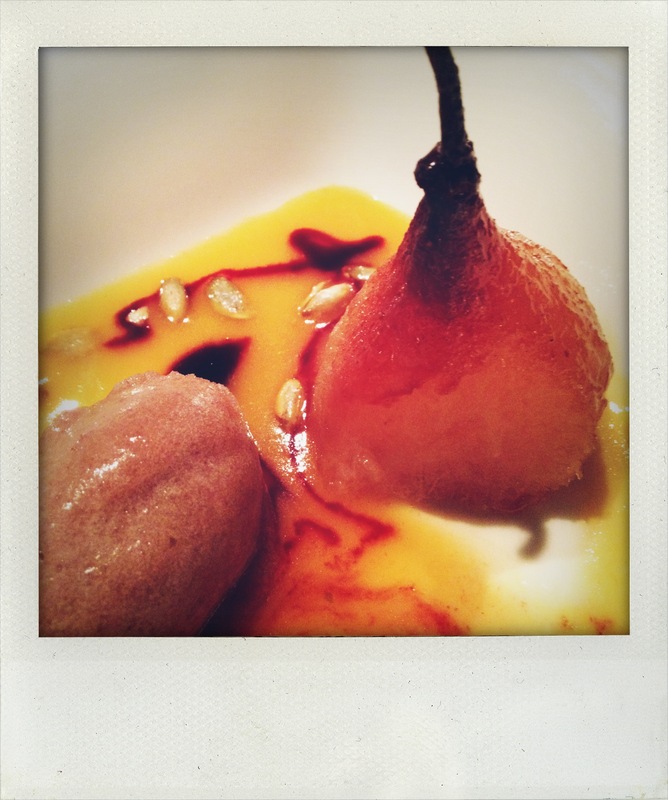 And just when we thought we were done, dessert appeared in all its glory: cardamom roasted pears with candied pumpkin seeds, melon and passionfruit broth, and pear and pomegranate sorbet. What more can I say? Chef Lorenzo Loseto is brilliant in his attention to detail, taste, flavour pairings, presentation, creativity, and mixing it up each time we go. Bravo. Bravo. Three times bravo. We’ve been ordering Indian Food “for delivery” on those occasional nights when you just don’t have the energy to cook. Problem is most of it is laced with ghee. So with Pizza out of the vegan equation, and Greek Souvlaki, and most other take-out foods, we didn’t want to give up Indian as well. Can you imagine my surprise when I read in Toronto Life about a new place called Udupi Palace that bills itself as “Authentic South Indian Vegetarian Cuisine Specializing in Vegan”!! Hallelujah and pick up the phone. Super nice people. Fabulous food. Great menu. Our favourites were the veg samosas, onion pakoras, veg uthapma, chana batura and masala, and the veg curry. I feel a bad habit coming on! I had heard Cafe Belong opened at the fabulous redevelopment of the Evergreen Brickworks on Bayview but it’s not the first place I think of when trying to decide where to go for dinner. It should be! I love the Brickworks, parking’s easy, and the cafe is lively, funky, and surprisingly homey. Not to mention Brad Long, chef and owner of the cafe, is to be congratulated and supported in his efforts to offer the city food as fuel, medicine, and love. The motto sucked me right in. But is it good? It was fantastic. The lentil and beet salad with kale and preserved lemon was a zingy, hearty, and wholesome way to start the meal. While not a huge fan of cabbage rolls, Brad’s main course vegan version – on the menu proper! – with almonds, apples, squash, beans, and wild rice had me licking my chomps. And I couldn’t resist a side of some of the best fries I’ve had in the city. The Niagara Hidden Bench Meritage (2008) made we wish I had ordered a bottle instead of a glass. Next time. And I’m hoping he’ll do a vegan version of the family style 5-course communal dinners. Pretty please? 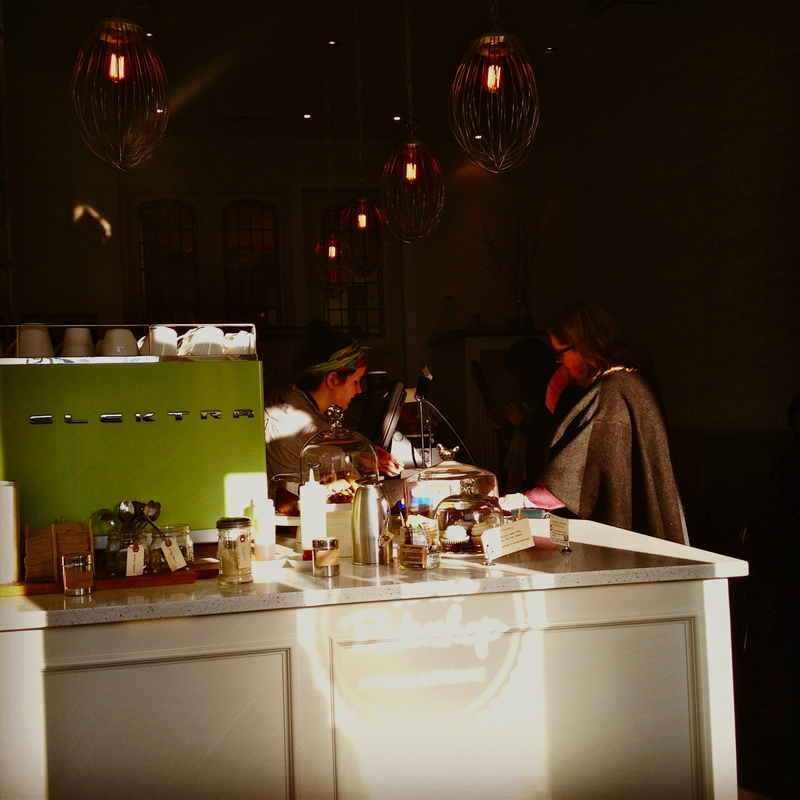 Patachou has been a time-honoured hub of coffee-drinking and croissant-eating. As one of the city’s best loved café-pâtisseries it has fed Toronto bellies for years with quiche lorraine, beef bourgignon, and tarte niçoise. Little publicized, it also boasts great French salads – some traditional French fare like green bean salad with red onions in a mustard vinaigrette, or du puys lentil salad with cumin, red onions, lemon and olive oil; others bring in some healthy and tasty alternatives like oriental noodles with broccoli, roasted peppers, and bamboo shoots. If you’re a hard-core vegan you can skip the desserts. If not, you can tuck into one of their butter-filled pastries like the mocha eclair. Tori’s Bakeshop is an eco-friendly, all-natural organic bakery that offers dairy-free, egg-free, casein-free, and refined sugar-free treats of all sorts. Confession: I offered to make a very special guy a vegan birthday cake for his 1st birthday. I failed miserably. What to do at 9:00 AM on a Saturday morning when the party starts at 10:00? Go to Tori’s. Her vegan cupcakes are some of the best I’ve ever had. And the café is cute. And welcoming. And a great place to have a quick soy latte when you need to pause in your day. I love what she’s doing and wish her all the success she dreams of. Prime is self-described as “a modern steakhouse, its burning fireplace lighting two rooms of tan leather, dark wood and a collection of paintings by Canadian artist Charles Pachter. In the kitchen, certified dry-aged Kobe, organic lamb and beef steaks are prepared in an infrared broiler.” For a modern steakhouse, we found it hilarious that they also have a vegan menu. Tucked away in the Windsor Arms Hotel, who would have thought? We had to try it out! The kale salad with creamy lemon dill tahini dressing, shaved apples, walnuts and raisins was fabulous. Best I’ve had. The nori rolls were also a lovely way to start a meal. Unfortunately the main course didn’t quite meet our expectations. The components – cornmeal crusted tempeh, sweet potato mash, portobello burgers etc. – were great. I think it just feel a little flat due to the lack of garnishes, sauces, and temperature. A little more attention to detail would amp up their vegan offering significantly. Nevertheless, they get full points for trying and taking the plunge into the deep end. Especially for a steak house! 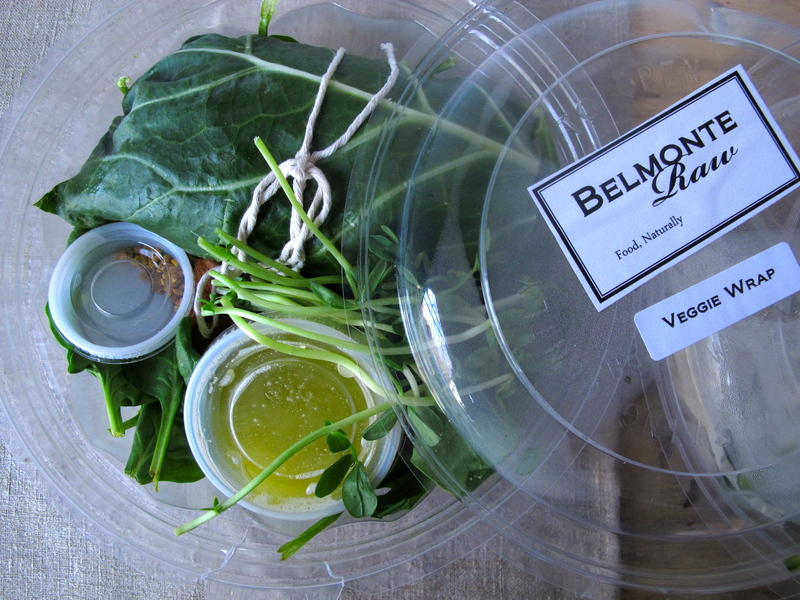 I’ve been hearing a lot about Belmonte Raw since it’s in the ‘hood and boasts raw vegan goodies. I was finally able to stop by today and check it out. The heart and soul behind Belmonte Raw is Carol Belmonte who started this fine establishment in order to offer you Torontonians cleansing, healing, and detoxifying meals. In addition to savory foods, she also specializes in guilt-free decadent deserts that are gluten-free, dairy-free, sugar-free and free of all animal products. Carol believes that food is the best preventative medicine that the planet has to offer. Can’t argue with that. The take-out menu features a Veggie Wrap and Zen Kale Salad that are both crisp, clean, and tasty. And the chocolate peanut butter tower? Yowsa. While they have a cute set-up with tables and chairs, Belmonte Raw is mostly take-out ready to cater to business and individuals alike. Ursa is doing some cool stuff. Supposedly their 2nd floor secret labrinyth is home of homemade yogurt, aged cider, micro-greens and other goodies culturing, fermenting, growing, and awaiting their fate. They have an explicit v:options on their menu which I always appreciate. I can’t even remember now exactly what I ate but the bowl shown above with tofu, beet chips, radish sticks and other tasty morsels was delicious. My dining partners had dessert which I wasn’t into so I opted for their aged fermented apple cider vinegar as a digestif. I have to say it was unusual and a little risky, but oh so good. Hats off to the folks at Ursa for taste, complexity, and bucking the trend. A friend of mine and I were getting together for a girls’ night out and decided to try Paramour (see below) because they are so v:friendly. Unfortunately they were closed for summer holidays or something so we hiked up the street and sat our v:asses on the patio at Foxley. Oh it’s oh so Ossington. Tonnes of people, great vibe, cute little space out back with pots of herbs and flowers. We were next to the basil and thyme. The menu is pretty fishy given the propensity of the chef but there were a few dishes we took advantage of like the inari sushi with grilled mushrooms, thai curry vegetables, crispy vegetable spring rolls, and kale salad with deep-fried shallots. Great quality food, nice wine list, a wonderful little spot to have on your list. I had lunch at One Love Vegetarian Cafe the other day rather spontaneously. I didn’t know a thing about it until I drove by and decided to give it a shot. Awesome Jamaican menu with roti, stews, and their famous corn soup. 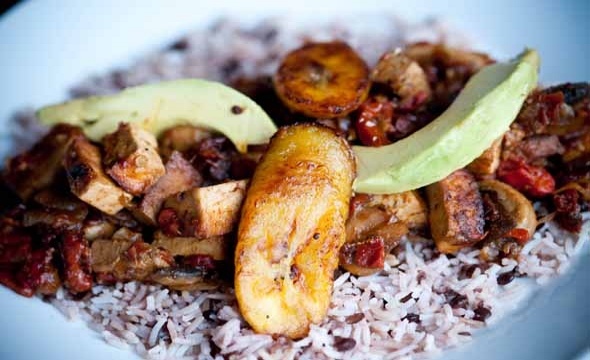 I got the BBQ Tofu Stir-Fry complete with organic tofu with sweet peppers, vidalia onions, tantalizing sauce, organic basmati rice and peas, fried plantation and avocado slices. It was good, it was fast, it was inexpensive, and I love the vibe. The owners seem great and I wish them all the success in the world. Next time it’s the corn soup for sure, and a roti filled with spiced Jamaican pumpkin on the side. Ruby Watchco is fun, hip, noisy, and tasty. Since they are a one-menu establishment (you get what you get) I was a little skeptical about whether they could deliver on the vegan front. But they did, quite happily so. They just made simple changes to the menu to veganize what they were already serving, as well as add a dish or two – cauliflower steaks, roasted heirloom carrots, couscous with stewed tomatoes and peppers, steamed kale, and maple-chipotle black beans which were to die for! It’s family style so everything comes in cute little serving dishes but don’t be fooled. Little though they may be, they pack a punch. I was stuffed when I left. We went to a fancy gallery show on Queen West the other day. It doesn’t happen often but we know the artist and so used it as a good excuse to head out for the evening dressed in our finest. Well, not quite, but almost. Anyhow, we needed a place to eat afterwards, we had heard of Fressen but had never tried it, so we thought since we were a block away that we would give it a whirl. It’s all vegan. It’s decor is nature-inspired. It’s dark and cozy. The wait staff are very nice. And the food is delicious. But beware: we were stuffed after the appetizer. The portions are huge so factor that into your ordering. They have all sorts of cold tapas from basil humus to spicy red lentil balls. We skipped those and headed right to pan seared mixed mushrooms on sesame spinach with lemon garlic sauce, and, for Andrew, seared polenta with herbed tomato sauce and shiitake spinach with balsamic glaze. See what I mean? A meal unto itself. After that it was spicy onion crusted tofu and charbroiled portobello, both with fresh, steamed veggies and grilled greens. Needless to say we left with a doggie bag. But not for our dog since we don’t have one; we ate it for lunch the next day which made me happy. All this to say, if you are out Queen West way, it’s definitely worth a visit. My friend’s dad came to visit from Ottawa and tried it. He’s relatively new to veganism and is a bit of a gourmand. She said he liked it so much he wanted to buy into the business. Now there’s an endorsement. 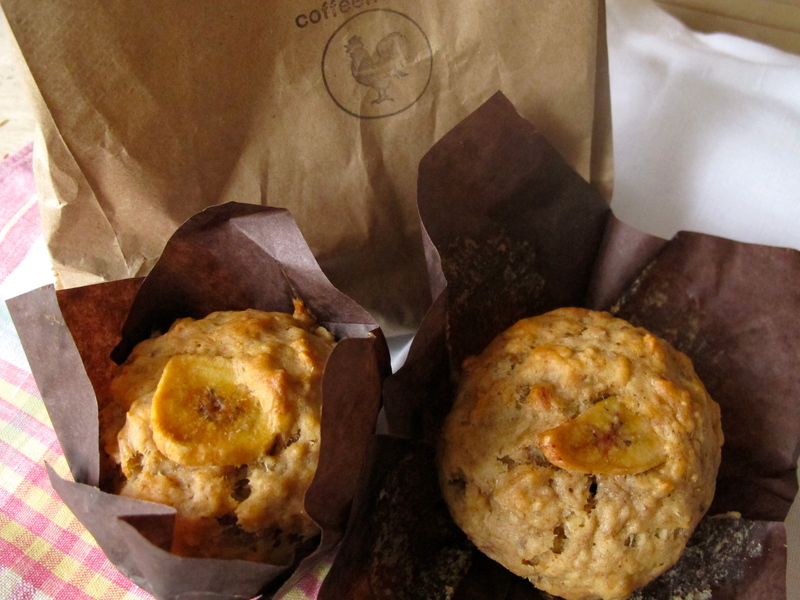 The oft-referenced-Rooster-Coffee-House now has vegan fare! Imagine my surprise upon arriving this morning for my regular soy latte to find a vegan peanut butter banana muffin calling out my name. Another reason why the Rooster is my favourite indie cafe. They bring them in from Desmond and Beatrice, another local haunt just down on Queen Street East, and they are packed full of nutty fruity goodness. If you’re in the neighbourhood, stop by and get one. Oh, and by the way, it’s a secret. The Rooster doesn’t bill them as vegan because, let’s be honest, lots of people are just turned off by the label alone. And remember when you’re in other cute little restos, there might well be vegan options for you that aren’t sold as such. So just ask. You never know, you might just get lucky. Omi, once a popular Church Street establishment, is now – lucky for us – in Cabbagetown. Sushi lovers flock to experience the Omi Sashimi and Omi Sushi but what about those of us who don’t partake in eating our underwater friends? We should flock there too! 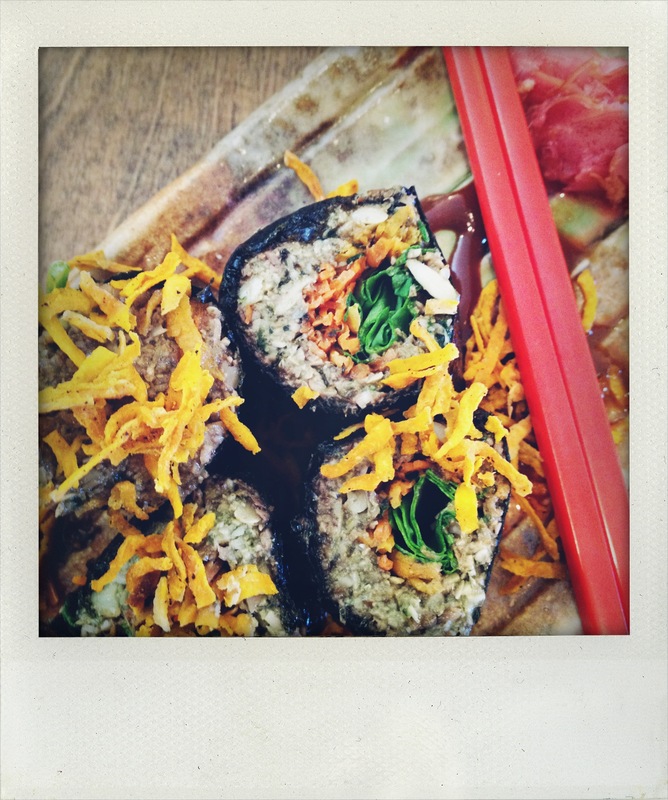 Vegetarian Sushi Rolls, Vegetarian Tempura, Seaweed Salad Delux, Vegetarian Gyoza, Fried Tofu Squares – they are all delicious. Not to be missed is the Organic Brewed White Miso Soup. It nourishes every cell of your body. Andrew and I think you could live on it and that, one day, it might change the world. It’s that good. I was at a Slow Food event called Picnic at Toronto’s Brickworks where chefs are paired with producers to create beautiful food. 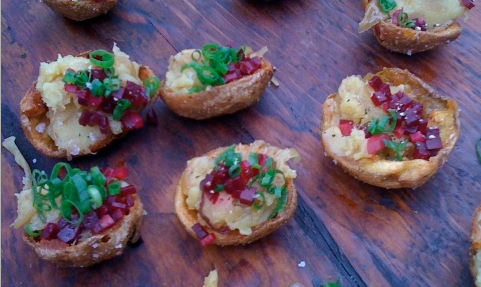 EVERYTHING was pork except one shining light, which was double baked potatoes – totally vegan – made by Marben chef, Carl Heinrich. Marben is not a vegan restaurant but Carl bucked the trend nevertheless and, in my books, got top marks for a creating a dish that was delicious and meat- and dairy-free. How could I not visit Marben? Well I couldn’t (not visit) so I did. The joy. Carl is cute, accommodating, and competent (not to mention nice). He pulled all the stops for me. To start, white bean puree layered with white and green beans, roasted red pepper something, and caramelized shallot dressing. Next? Lentils and cavatelli fricassee with mushrooms, brussels sprouts, and watercress. I thought I was done but they asked if I wanted more. Of course the answer was yes so Carl came up with what he called Ruth’s Dish. BRING IT ON! A dish named after me (I admit my weakness for flattery and gratuitousness) – shallot puree with steamed chard, vegetables a la grecque, roasted pumpkin seeds and fried capers. Holy Holy. Fabulous. And not just because it was named in my honour (honest!). Then for dessert – caramelized apple with canned peaches (from summer’s bounty), also caramelized with sugar and peach schnapps, topped with toasted hazelnuts and thyme. OMG. Yum and yum. Carl asked if we’d come back and sit at the Chef’s table. Well, I did go back, but didn’t request the chef’s table, and it was okay. I think Carl’s probably a gem and clearly competent in the veggie department as witnessed by the fab menu above. But the wait staff? Not so much. When I asked for vegan I was told that “I came to the wrong place.” Really? Could I talk to Carl about that please? We’ll try once more and let the 3rd visit be the tie-breaker. Live Food Bar is all about raw and all about vegan. They’ve got an extensive menu ranging from Jicama Poutine to Kale Cesar to a Raw Mediterranean Tart. I had the raw pumpkin and sunflower seed nori rolls with carrot and yam tempura, miso maple glaze, and fresh pickled ginger. And then moved onto the tempeh red pepper cakes with warm white wine corn avocado salsa, steamed greens, chipotle and sesame aioli. It was all creative and tasty and satisfying. But one question – why, when I want to eat at a vegan restaurant – do I need to listen to the juice blender going in the background? Have you noticed? So many vegan places have an open juice bar so all the customers are tortured while they eat with the sound of the motor going. Please. Can we pick it up a notch? It was my birthday so Andrew decided to take me to Splendido for a nice night out. You hear a lot about how fab Splendido is so we called ahead to check their vegan friendliness, and headed out with enthusiasm. Hate to say it but it was a total disappointment. There is a big difference between chefs who embrace the possibilities alive in legumes, veggies, and grains and those that think vegan just means hold the meat and cheese. Splendido’s chefs that night were unfortunately in the latter camp. Basic pasta with flat tomato sauce and what I thought was a pretty boring salad. Yawn. Amaya is an up-scale Indian restaurant that we enjoyed thoroughly before embarking on this vegan path. We stopped going after becoming vegan because we assumed that the food would be full of ghee (clarified butter) so often used in Indian food. We were wrong to assume. I found myself there one night after a friend’s car broke down (we were stuck and hungry) and discovered to my very pleasant surprise that they are happy to prepare their veg dishes sans ghee. As I’ve said before, ask and you shall receive. It’s a great night out and the food is super tasty. So tasty in fact that you can’t stop eating it. We’ve been known to stumble out of there with an ache in our stomachs and extra naan (or should I say roti) in our pockets! Okay, so Soma’s not a restaurant but I had to add it for two reasons. One, the chocolate is to die for. It’s heaven in a box. Soma is one of the only artisan chocolatemakers in North America making chocolate in small batches directly from the cocoa bean. Two, the chocolate chef is really cute and super nice. We love him. My two fav vegan picks are, of course, any of the dark chocolates that don’t contain dairy (and there are many options), and the spiced pecans which are perhaps one of the more addictive things I’ve eaten in my life. It’s a must-visit, must-buy, must-eat kind of place. So that really cute chocolate chef I mentioned above has hung up his chocolate-making hat and has started his own venture – Blackbird Baking Co. – housed in the new Soma on King Street. 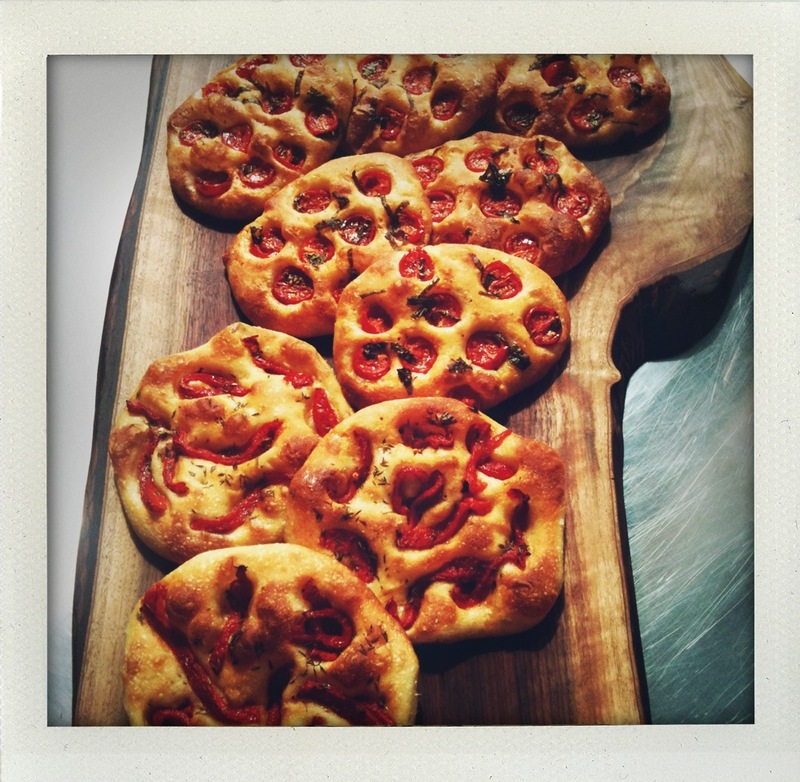 He’s got focaccia with dried cherries, yellow raisins and almonds. He’s got pizza bianca with olive oil, rosemary and breadcrumbs. And he makes killer sandwiches which aren’t necessarily vegan but I can vouch for the fact that he’s very vegan friendly and aims to please. I had a custom-made v:sandwich which I ate under one of their elegant yet rustic wooden chandeliers while looking into one of the grooviest baking spaces I’ve ever seen. And when you’ve licked your lips after the last savoury bite, head to the front of the store and get some of Soma’s famous vegan gelato. For any of you that have read my musings you’ll have seen the picture of my friend Michel Awad eating a really big, really greasy hamburger. He loves it. The greasier the better. That’s why I was surprised he introduced me to the Cruda Cafe in St. Lawrence Market. His friend Claudia started it. Took a gamble. Changed her life. Went out on a limb. Good for you Claudia! I applaud your bravery (and your cooking). The food is fantastic and incredibly healthy. I especially like the Wild Mushroom Pecan Bistro Burger and the Enchiladas (flourless organic corn wraps, with guacamole, spinach, house salsa, and marinated Portobello mushrooms). I challenge anyone to eat there regularly and not feel the immediate benefits of just saying no to the grease. L’espresso is a semi-regular haunt of mine to grab coffee when I have to meet with someone outside of the office. It’s central, on the subway line, has a great patio, and is relatively low key so it’s good for a quick business chat over a latte. I went the other day – hadn’t been there in awhile – and much to my surprise they now have 3 vegan wraps on the menu. Wow. I haven’t found that it’s the old Italian establishments that are the first to latch onto vegan alternatives so good for them. Head on down for the magic vegan wrap (avocado, spinach, mushroom, tomato, scallions and chick pea spread on a roasted red pepper tortilla), the fiesta vegan wrap (roasted red pepper, sundried tomato, arugula, chick pea spread, on a roasted red pepper tortilla) or the deluxe euro wrap (grilled tofu, sundried tomato, arugula, plum tomato, basil, olive oil on a roasted red pepper tortilla). Their breakfast hasn’t quite kept up pace but one thing at a time I suppose. I will wait with anticipation. I would be totally remiss on a blog about v:eating out in TO not to mention Fresh. It’s almost so obvious I overlooked it. Fresh was started in 1990 as a juice bar called Juice for Life by Ruth Tal. Thinking back to the early 90s it was probably one of the few – or only – vegan options in this city and, thank God, it was successful because it’s an awesome place to have breakfast, lunch, or dinner. It’s noisy, and crowded, and can be a bit of a scene but the food is fabulous and it’s all vegan, although dairy is offered as a side option throughout the menu. I like that. My favourites are the fresh bowls, particularly the green goddess, powerhouse, and buddha bowls. And when you’re there, check out their cookbooks. I have both and often use them for inspiration. 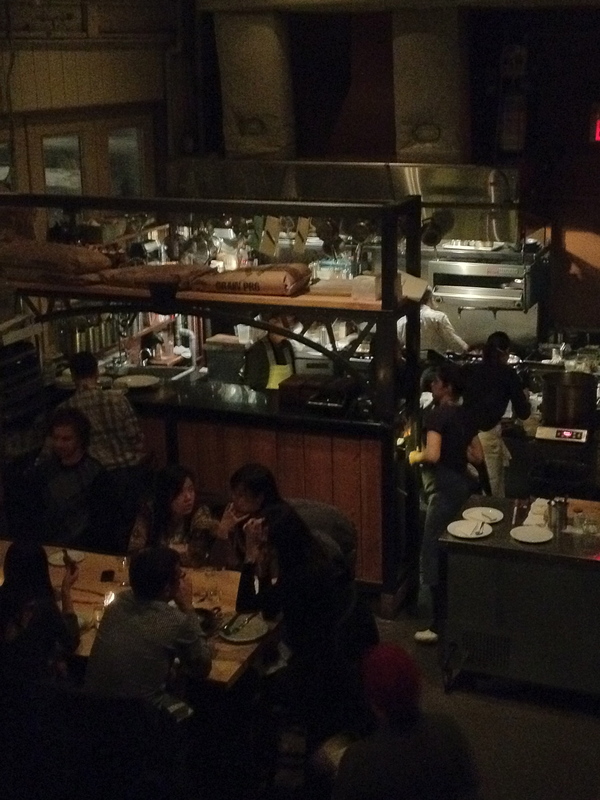 It took us months to get a reservation at Woodlot that wasn’t at either 5:00 or 11:00 PM. So that was irritating. But once we got in, it was a totally pleasant, enjoyable, tasty night out. The atmosphere is warm and inviting and chatty. Like a good fire-side party at home with good friends. And the menu is in fact two menus – one for meat-lovers and one for veg-lovers. You have to love that. The veg menu does have lots of cheese and butter and stuff so I asked for vegan which they accommodated without flinching. No questions asked, no issues, no problem, no attitude. And it was really good. I should have written down what I had but I didn’t. I was too busy enjoying it. Suffice it to say that is was a well-constructed combo of grains, marinated tofu, mushrooms, and grilled veg. And the others? 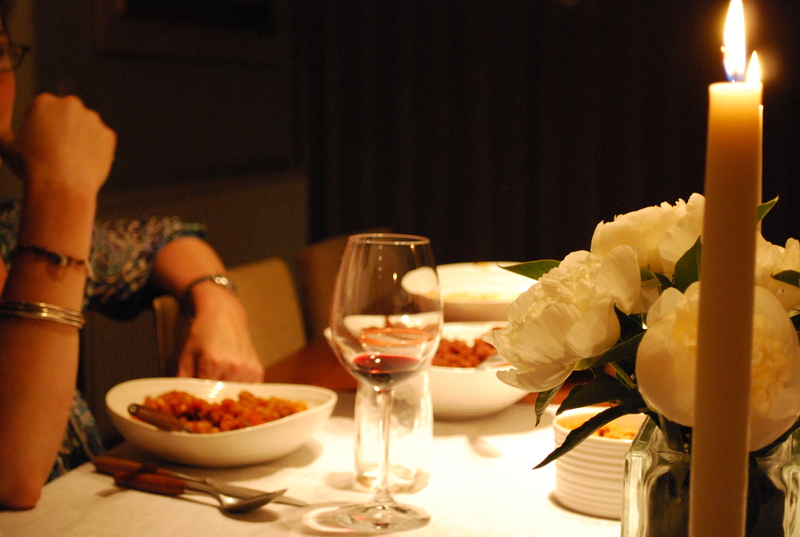 One dinner guest had vegetarian; one had pescetarian; one had a big hunk of meat. Love that they can meet us all where we’re at! Here’s hoping the hype dies down so we can eat there more spontaneously. This is so super handy – great idea! Can I be a guinea vega-pig with you? I’m trying Earth next week, will let you know how it is. Oh – and I tried Sadie’s Diner a few weeks ago which is great for good ole heartwarming breakfast (love that you can get a vegan “diner” style breakfast there – something I’ve missed since I stopped eating eggs). Ruth, fantastic article! And, now we have fun new places to try! I think one needs to be careful with Naan bread … a lot of recipes call for one of milk, ghee, yogurt, egg … or I’ve seen a combo of all four! So, it’s a good idea to ask the restaurant. You are absolutely right. The naan was actually a reference to our pre-vegan days. We have been getting roti these days and I like it just was well. Thanks for the clarification! I highly recommend Jean’s Vegetarian Kitchen on the Danforth! Delicious veggie Thai food and family friendly atmosphere. You can indicate that you want your food done vegan and they understand and do a great job! 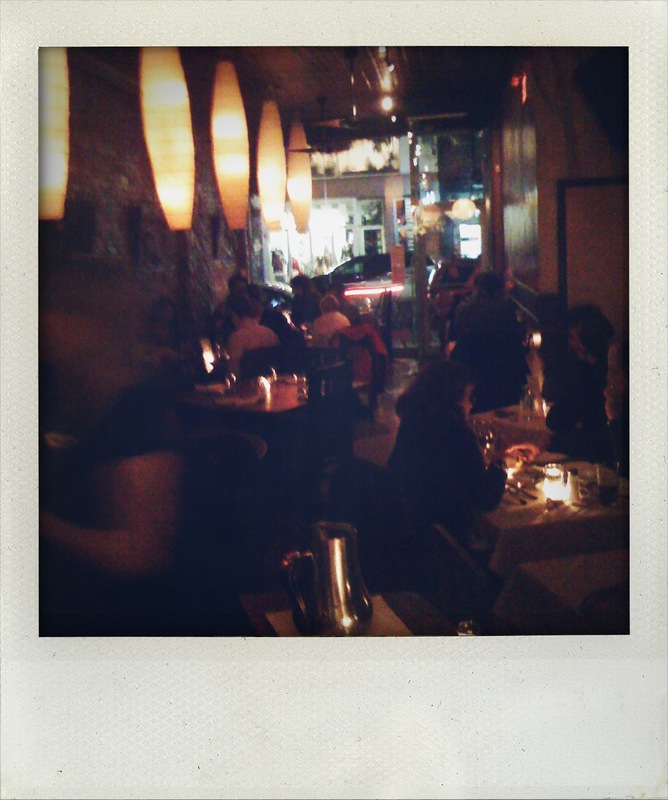 Emily and I went to Zen Kitchen http://www.zenkitchen.ca last night and had the best meal ever. Emily said nothing anywhere else even comes close. I would love to come to Ottawa to try Zen Kitchen. I have heard great things about it from others as well!! I do find myself there once in awhile so it’s on the list. Thanks for the tip and next time you’re there maybe you could suggest they open a sister resto in Toronto? We could use a few other good options. Funny you should post this now. Andrew just sent me an article called Why are Vancouver’s hungry vegan crowds forced to hunt for a meal? We have so far to come to but there is so much potential that I can just taste it! I’m calling you up next time I’m Ottawa-bound. Ruth, we’re waiting for you to come to Ottawa because there’s another vegan restaurant Café My House that I now think is even better and was just anointed as the best vegan restaurant in Ottawa (ahead of Zen Kitchen) by WHERE Magazine. They’ve got a pretty active vegan blog as well http://www.cafemyhouse.com/ (but no recipes). This is SO helpful and I wish more restos would read it. It’s a joy to discover v:passion in chefs and on menus. Thanks for the excellent list. Needs to be published in resto-guides. Thanks and I’m glad you find it helpful. Reminds me that I have a few more on my list that I need to add. Will get on that pronto! The black sausage was way better than the real thing and the vegetables were perfectly cooked. I was on my own (the night you had a shower for Emily) and I had just walked in at their busiest time, but they made room for me at the bar. There was a bit of a wait so the bartender brought me some hummos on the house. He’s a musician from Jamaica who’s a very engaging guy.I told him I’d bring the then yet to be born Gideon in next time, and we’d all have a beer together. We just decided to come to Toronto on the Nov 19 weekend so maybe that’ll be sooner rather than later. Keep up the good (food) work…. Thanks Glenn and I’ll look for you crawling out of Fressen next time I’m on Queen West. By the way – NEWS FLASH!!! – as of noon today. I just found out that the Windsor Arms Hotel has just launched a vegan menu. Can’t wait to get dolled up and try it out. I’ll report back if I get there before you do. This is an amazing list. Amazing. Thank you. Grilled pickled (in our secret marinade made with a hint of beet juice) tempeh loaded with melted Daiya cheese, house-made vegan russian dressing, organic sauerkraut, served toasted on buckwheat chia or quinoa honey gluten-free bread . Sounds fantastic! I would love to try it out next time I’m in Burlington. I particularly like the sound of the Reuben. Thanks for the recommendation … any and all welcome. 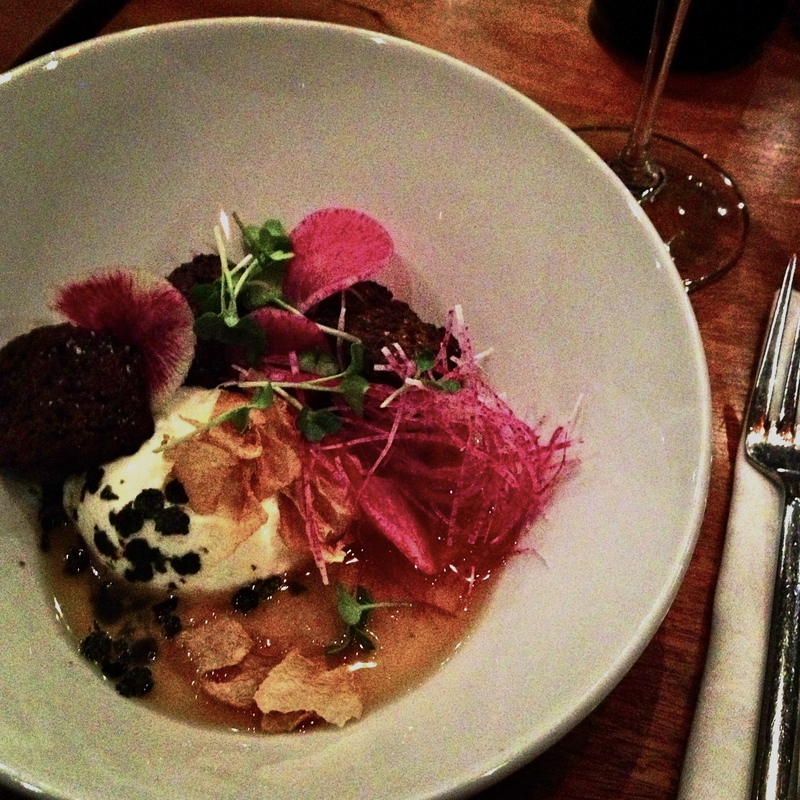 1 of 25 Vegetarian/Vegan Restaurants in the WORLD to be featured in Happy Cow’s Cookbook! There will be two recipes from Kindfood featured in the book.